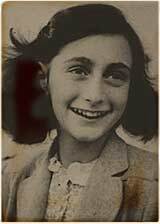 This site contains resources for the study of Anne Frank and the Holocaust. We have written it to coincide with the Anne Frank: A History for Today exhibition which tours the UK continuously, and which came to Beverley Minster for the month of September 2001. For visitors who do not know our part of the world, Beverley is the county town of the East Riding of Yorkshire, in England, which is part of the United Kingdom. This site began life as a place where teachers would find help for the English and Welsh National Curriculum, but we soon saw that Holocaust Education is international. We have already had lots of contact and messages from visitors living in all parts of the world. Some things on the site may not be of interest to you, but we hope you will find good things - and share your ideas with us. Marco Koene, of Veurs College, Leidschendam, Netherlands, has sent us two accounts of Anne Frank's life. Students from Veurs College and a partner school in Italy, wrote these - in English! The life story of Anne Frank teaches us that national differences should not be frontiers. We hope you will help yourselves to things on this site. Visitors from Scotland and Northen Ireland are also very welcome but you don't have to use the same curriculum as those in England and Wales! There are many excellent websites which support the study of Anne Frank's life and death, and the history of the Holocaust more generally. Many of these have far more extensive resources than this site. What we have tried to do is to create teaching resources, related to Anne Frank and the Holocaust, for a wide range of subjects in the UK National Curriculum. We have also attempted to create a guide to the best of the other resources on the World Wide Web or otherwise in the public domain. Please use the schemes of work on this site. If there are things which should be here, but which you can't find, please tell us. If you have resources which you would like to make available to other students, teachers and educators, please send them to us. If you think we should have a link to your site or other resources, please let us know. We must never forget what the result of intolerance and racial bigotry can be. The persecution of the Jewish community and other minorities by the fascist regime in Germany has scarred our century. From an address by Tony Blair, Prime Minister of the UK, in Southwark Cathedral, London, England, January 1997.